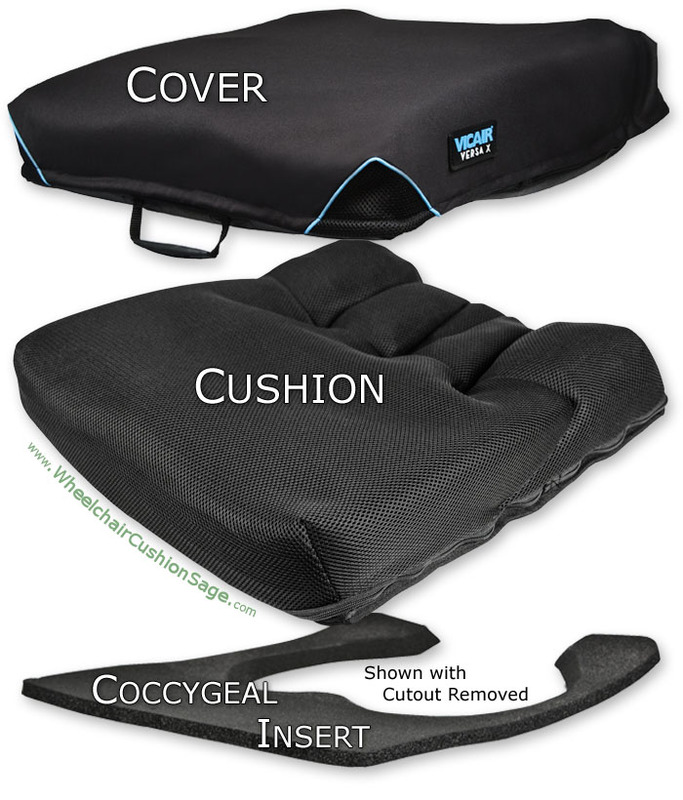 The Vicair Versa X wheelchair cushion (see larger picture below) can generally be categorized as a hybrid cushion due to its weight bearing foam and air-filled cells. The manufacturer of this product, Vicair (in the USA - The Comfort Company is the source) specifies this cushion as follows. Vicair's Versa X consists of a contoured foam front and a pre-contoured array of 5 individually adjustable chambers in the rear. Each chamber contains a user-changable quantity of permanently sealed tetrahedron-shaped air cells. Vicair accomplishes the weight bearing function differently than other manufacturers of air cushions. The Vicair Versa X; in addition to foam, employs many small permanently sealed air filled cells, rather than larger valved air cells. Each of the many small Vicair air cells is shaped like a tetrahedron (a volume enclosed by four sides). 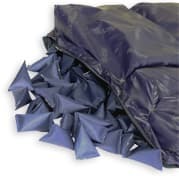 The feel of the rear portion of the cushion can be adjusted by unzipping the liner and removing or adding an appropriate number of air cells. A pack of 50 extra air cells may be purchased with the cushion (refer to the cushion options above). The Versa X's many-cell structure eliminates the leak-related catastrophic failure mode associated with other types of air cushions. The tetrahedron-shaped cell structure also slightly increases the user's seating stability as compared to typical valved-types of passive air cushions. The Versa X's foam front portion also provides a stable hand-placement surface for chair transfers (i.e., transferring into and out of the wheelchair). The X-series covers include Comfort-Tek and Stretch-Air, the Glidewear option being available for both covers. The Stretch-Air cover is the more breathable of the two covers, the Comfort-Tek cover being designed as an incontinence barrier. 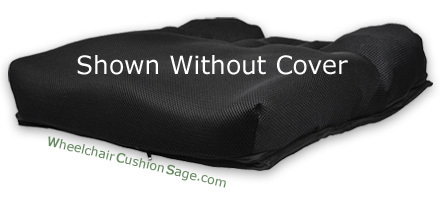 The Glidewear cover option can be applied to the top surface of the Comfort-Tek and Stretch-Air covers. Glidewear adds both a low-friction area on the rear of the cushion cover where bony prominences encounter shear forces, and a high-friction surface at the thigh areas and gluteal perimeter that helps keep the user from slipping into a sacral seated position (i.e, slumped with hips too far forward). NOTE: Vicair Versa X cushions are made-to-order. The manufacturing process typically takes 4 business days. For example, if the "Fast" shipping method is selected for a Vicair Versa X, the actual transit time will indeed be fast (1-2 business days), but your cushion may be delayed by 4 business days before leaving the facility. Please consider these manufacturing times when selecting the shipping speed for Vicair cushions.